This afternoon I found some interesting documents from the marriage of my 4th Great Grandparents Adam Sears and Susannah Kern. 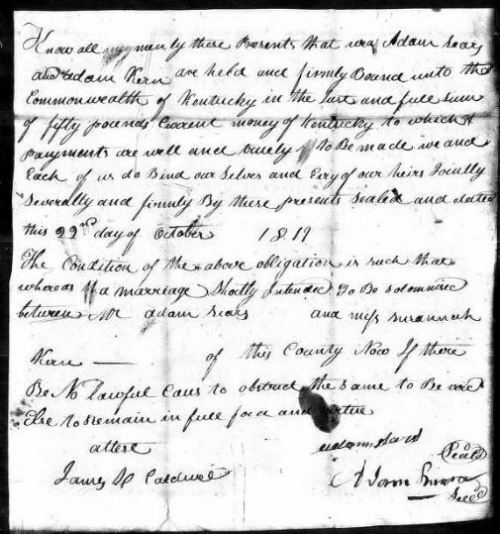 Adam and Susannah were married on October 26, 1819 in Nicholas County, Kentucky. 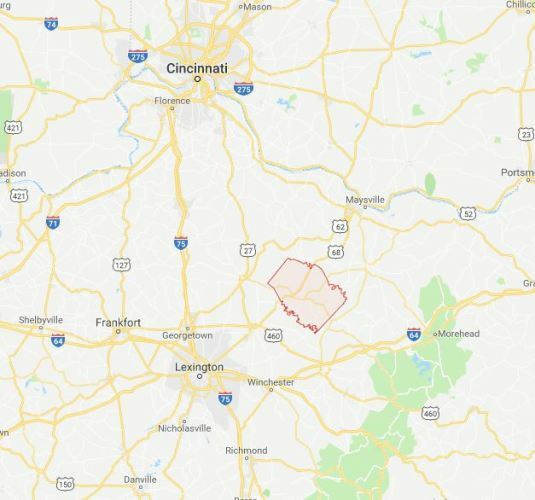 Here you can see that Nicholas County is near Lexington, Kentucky. The first document is a bond between Adam Sears and Adam Kern the father of Susannah. The bond is in the amount of 50 pounds current money of Kentucky. The bond was signed four days before the marriage. Next is the marriage license which was also issued on October 22, 1819. This is to license and permit any duly authorized minister of the Gospel to join together in the holy state of matrimony Adam Sears to wife Susanah Kern of this county agreeable to the rights and ceremonies recognized by law given under my hand as Clerk of the Court of the County aforesaid this 22nd day of October 1879. 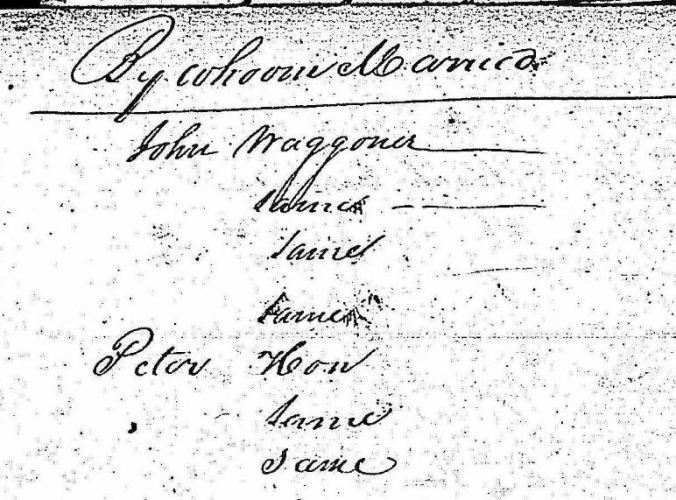 This may be a bit hard to see, but it is the marriage register showing that Adam Sears and Susannah Kern were married on October 26, 1819. You may see that one column has the word “Same”. This is the column for who performed the ceremony. The minister who performed the marriage ceremony for Adam Sears and Susannah Kern was Peter Hon. The documents do not state where the ceremony took place, but most likely it was at East Union. Peter Hon did not become the minister of the East Union church until 1824, but it was his home community. By 1819 Peter Hon along with the Hostetler, Sears, Kern and other families had separated from the Dunkard or Brethren churches. It also makes sense that Peter Hon would perform the ceremony as he was a step-cousin of Adam Sears. Someday I would like to visit this area of Kentucky and see where my ancestors lived. Shortly after their marriage Adam and Susannah moved to Harrison County, Indiana where they were in the 1820 census. I plan to write more about Adam Sears in a future post, but I need to do more research. 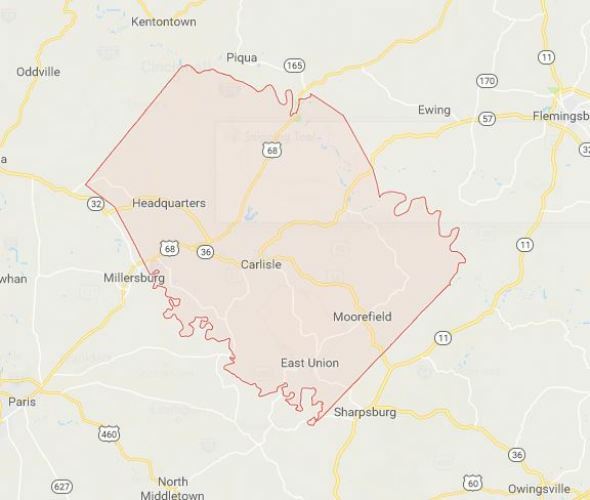 This entry was posted in Family History, Genealogy and tagged East Union Church, Hostetler, Kentucky, Kern, Marriage, Nicholas County Kentucky, Peter Hon, Religion in Family History, Restoration Movement, Sears. Bookmark the permalink.